We often get asked what wine to serve at a Thanksgiving Dinner. 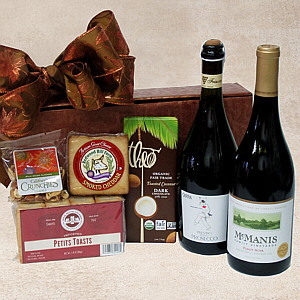 We picked two wines that are extremely popular with our customers at our Fancifull tasting events and will pair well with not only Thanksgiving but for many occasions: Carra Prosecco for before or during the meal and a McManis Pinot from San Luis Obispo that should be perfect with turkey and all the side dishes. We thought we would include smoked Goat Cheese, Petite Toasts, Almonds and a Theo Coconut Chocolate Bar just to get the party started.